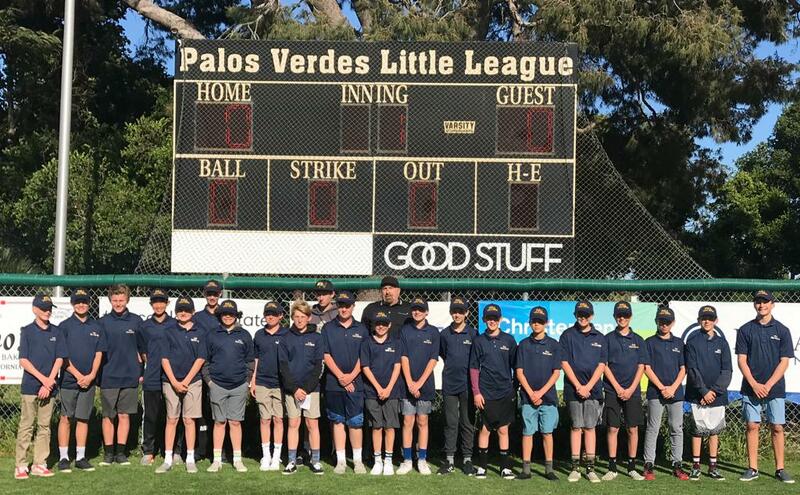 For many years Palos Verdes Little League (PVLL) has organized a Youth Umpire Program intended to increase participant’s knowledge of the rules of the game, build character and foster continued youth involvement. The ultimate goal of this program is to give youth an opportunity to learn, succeed and be rewarded in a challenging and safe environment. Youth umpires work with Pro umpires to staff field positions only at PVLL season games (all behind the plate umpiring is conducted by Pro Umpires). Youth umpires obtain specific training and follow clearly defined procedures and protocols. Youth umpires are responsible for controlling the actions of two teams of players, managers, and fans. That is a BIG responsibility! PVLL Youth Umpire hat and game indicator. Payment for games completed and recorded. Attend both the informational rules and field mechanics trainings. Pay attention to the game and make sure you are doing your job correctly and with enthusiasm. Work in a professional manner. Be dedicated and have the self-control necessary to meet the job requirements. Be honest and accurate to the best of your ability. Communicate clearly and decisively when making play decisions. Work cooperatively with Pro Umpires. Dress appropriately and bring necessary job equipment to scheduled games (PVLL Youth Umpire Hat, non-baseball logoed clothing, indicator, tennis shoes). Follow the youth umpire rules as learned in field mechanic training(s). NOTE: Youth Umpires will umpire only in the field position (only Pro Umpires can be behind the plate). All youth umpires must attend PVLL Youth Umpire training each year before they can umpire games. The training consists of attendance at one (1) PVLL Rules Meeting for both youth and their parents, as well as one (1) Field Mechanics Training - (See Training Events in the League calendar or off to the left). Should you not be able to make a scheduled training due to illness or other emergency, contact the PVLL Youth Umpire Coordinator immediately. The PVLL Youth Umpire Coordinator conducts youth umpire scheduling to ensure game coverage. Both manual and online scheduling will be conducted to ensure coverage of all PVLL minor, intermediate and major games. Youth Umpires will be compensated at the rates shown below. In addition, Youth Umpires are eligible to receive one (1) hamburger or hot dog and one (1) drink from the snack shack at their scheduled game field. If a game is cancelled at the last minute due to weather and/or other reasons, the Youth Umpire will be compensated for their time as scheduled. In order for payment to be made, Youth Umpires MUST sign-in on the Youth Umpire Game Log in the snack shack at their game scheduled field. Youth umpires are to report to their shift dressed appropriately with a good attitude and ready to work! Youth umpires are forbidden to use cellphones during games they are working. You may keep a cellphone in your pocket, but you may not be on the phone at any time during the game. Youth Umpires are required to SIGN IN for their shifts in the snack shack at their assigned field. Youth umpires CANNOT work a game where they have a sibling playing during that game. It is IMPORTANT that you show up to work the games you are scheduled! IF you cannot fulfill your commitment, please contact the Youth Umpire coordinator IMMEDIATELY to ensure game coverage. If any Pro Umpire, manager, player or fan speaks to you inappropriately at any time during/after a game, please contact the PVLL Youth Umpire Coordinator immediately. For specific questions about the program, please contact the PVLL Youth Umpire Coordinator.